On, on, U of K, we are right for the fight today. 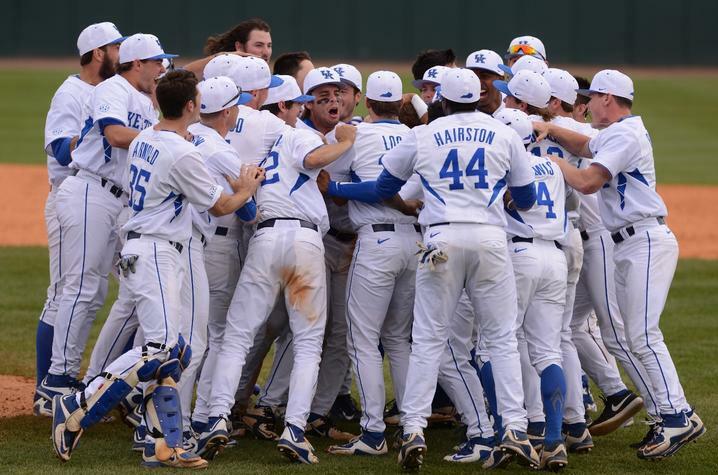 The new home of Kentucky baseball has been officially named Kentucky Proud Park - a tribute to farmers and businesses of the Commonwealth and Big Blue Nation. Complete with permanent seating for 2,500 fans, stone terraces, grass berms, and a 360-degree concourse that will bring its regular-season capacity to approximately 5,000 spectators, Kentucky Proud Park's team areas give players and coaches everything they need to succeed while creating an ideal place for fans to support them. In addition to these newly opened venues, new facilities for the men’s and women’s tennis programs are currently being planned. The transformation of the longtime home of Kentucky football included brand-new premium-seating areas, press box, concourses, concessions and restrooms, as well as team facilities and a multi-purpose recruiting room. The new Kroger Field features seating for 61,000 fans. Additionally, a new football practice facility adjacent to the stadium contains a state-of-the-art weight room, meeting rooms, locker room and fields. The football-related upgrades headline a revitalization of athletic facilities in recent years. In less than four years, new competition and practice facilities for the track and field, men’s and women’s soccer, softball programs, as well as the UK Golf House have been completed. The Wendell & Vickie Bell Soccer Complex – completed in 2014 – houses separate facilities for the men's and women's programs, including new team rooms, player lounges, locker areas, coaches’ offices, press box and a new grandstand. Combined with the 2011 additions of a $600,000 playing surface, a new video tower and a video board, it sets the standard for college soccer facilities. April 13, 2013 marked the official grand opening of John Cropp Stadium. The softball stadium features 1,500 seats, a spacious press box, two luxury suites and a first-class indoor hitting/fielding facility complete with a locker room, team lounge and offices. The University of Kentucky Outdoor Track and Field Complex gives the Wildcats one of the premier home tracks in the nation. Officially opened on Oct. 5, 2012, the facility provides the UK track and field program with a state-of-the-art training and competition venue. With grandstand seating for nearly 3,000 spectators and a video scoreboard to go along with the Meet Administration Building, the UK Track and Field program boasts one of the finest homes in the country. Learn more about UK Athletics.